Recombinant monoclonal antibody to Phl p 1. Manufactured using AbAb’s Recombinant Platform with variable regions (i.e. specificity) from the phage display antibody Clone 25. Immunogen: Recombinant Phl p 1, a grass pollen allergen. Specificity: This antibody binds to the Timothy grass allergen Phl p 1 and shows cotss reactivity with natural group 1 allergens from a variety of grass species such as oat, sweet vernal grass, Bermuda grass, rye grass, common reed, Kentucky blue grass, rye, wheat and maize (weak). Application Notes: This antibody bidns to Phl p 1 and competes with up to 43.4% (mean 19.8%) of IgE from allergic patient serum. 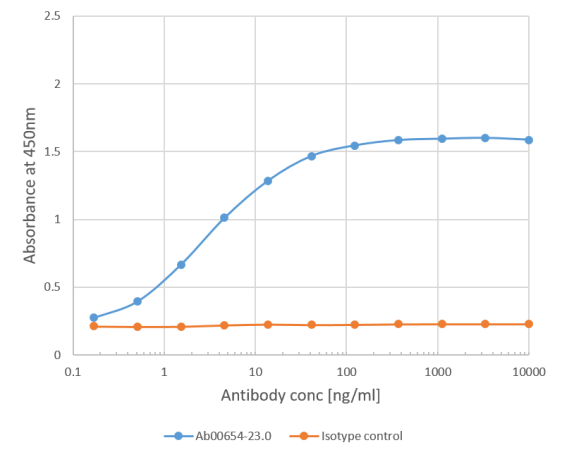 Binding curve of anti-Phl p 1 antibody Clone 25 (Ab00654-23.0) to Phl p 1 ELISA Plate coated with Phl p 1 (RayBiotech, 228-22412) at a concentration of 2 µg/ml. 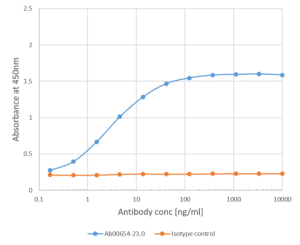 A 3-fold serial dilution from 10,000 to 0.1 ng/ml was performed using Ab00654-23.0. For detection, a 1:4000 dilution of HRP-labelled goat anti-rabbit antibody (Bio-Rad) was used. 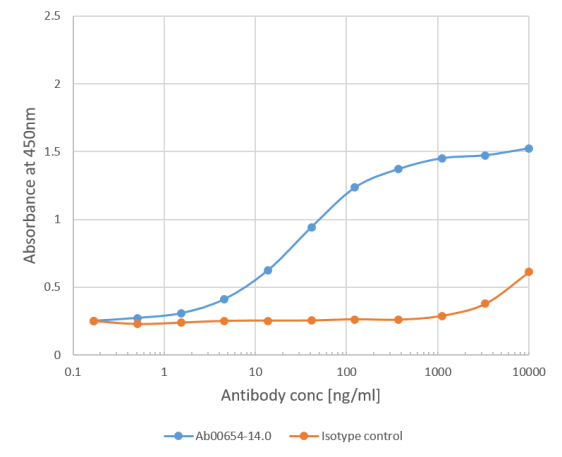 Binding curve of anti-Phl p 1 antibody Clone 25 (Ab00654-14.0) to Phl p 1 ELISA Plate coated with Phl p 1 (RayBiotech, 228-22412) at a concentration of 2 µg/ml. 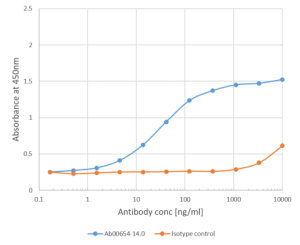 A 3-fold serial dilution from 10,000 to 0.1 ng/ml was performed using Ab00654-23.0. For detection, a 1:4000 dilution of HRP-labelled goat anti-human kappa antibody (Bio-Rad) was used.